The deepest X-ray image of the sky shows that black holes are aggressively growing by 800 million years after the Big Bang. These black holes are growing in tandem with the galaxies in which they reside. The new results show there were at least 30 million black holes before the Universe was a billion years old. The Chandra Deep Field South was made by pointing the telescope at the same patch of sky for over six weeks of time. Astronomers obtained what is known as the Chandra Deep Field South (CDFS) by pointing the telescope at the same patch of sky for over six weeks of time. 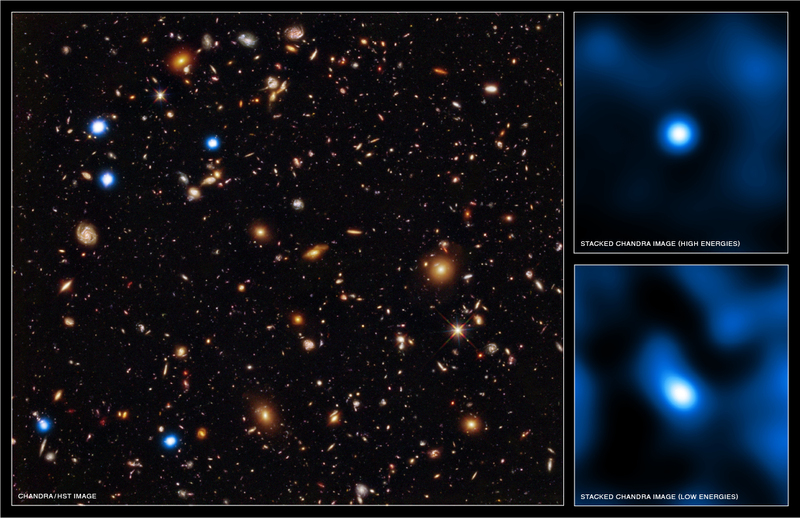 The composite image shows a small section of the CDFS, where the Chandra sources are blue, the optical HST data are shown in green and blue, and the infrared data from Hubble are in red and green. The new Chandra data allowed astronomers to search for black holes in 200 distant galaxies, from when the Universe was between about 800 million and 950 million years old. These distant galaxies were detected using the HST data and the positions of a subset of them are marked with the yellow circles (roll your mouse over the image above). The rest of the 200 galaxies were found in other deep HST observations located either elsewhere in the CDFS or the Chandra Deep Field North, a second ultra- deep Chandra field in a different part of the sky. None of the galaxies was individually detected with Chandra, so the team used a technique that relied on Chandra's ability to very accurately determine the direction from which the X-rays came to add up all the X-ray counts near the positions of these distant galaxies. The two "stacked" images resulting from this analysis are on the right side of the graphic, where the bottom image shows the low-energy X- rays and the top image has the high-energy X-rays. Statistically significant signals are found in both images. The stronger signal in high-energy X-rays implies that the black holes are nearly all enshrouded in thick clouds of gas and dust. 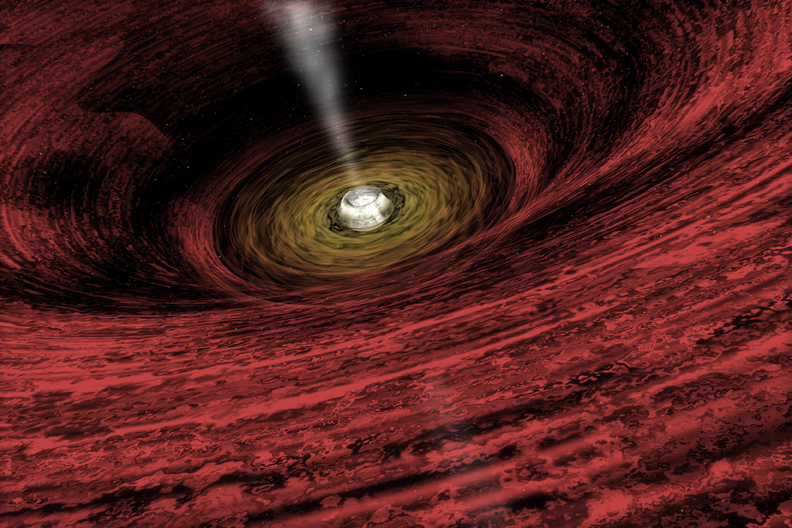 Although copious amounts of optical light are generated by material falling onto the black holes, this light is blocked within the core of the black hole's host galaxy and is undetectable by optical telescopes. However, the high energies of X-ray light can penetrate these veils, allowing the black holes inside to be studied. Deepest X-ray image of the sky contains objects over 13 billion light years away. 12.7 to 12.9 billion light years from Earth. Combines the deepest X-ray image ever taken with optical and infrared data from Hubble. About 490,000 light years across. X-ray (Blue); IR (Red, Green); Optical (Green, Dark Blue). 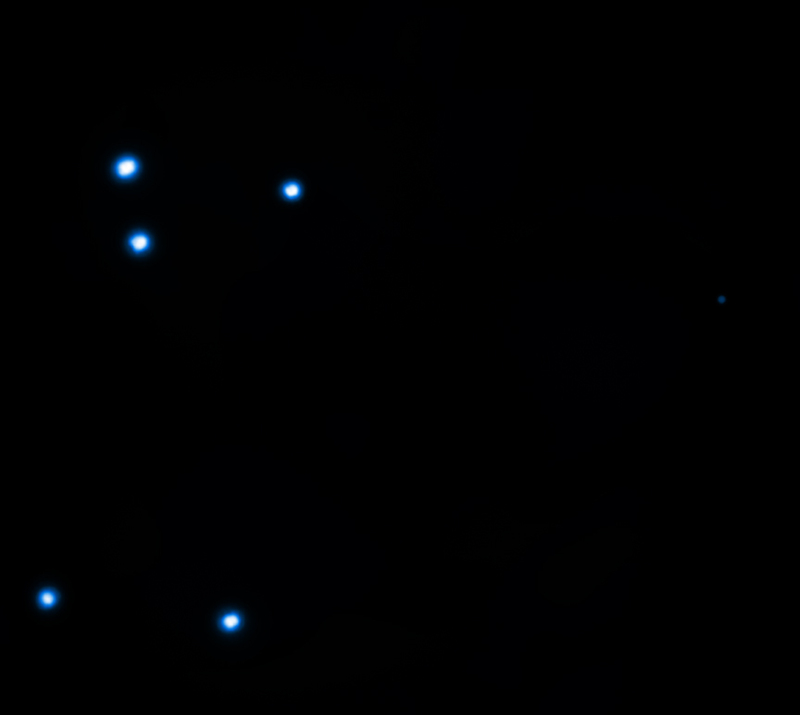 In the constellation Fornax, visible from Southern Hemisphere.